Church is not just about a Sunday service; there is always something going on in the week. Raising a generation of people who are joy-filled, resilient, and empowered means teaching our kids to have a strong relationship with Jesus. Hope Church is here to partner with you in this. We provide your kids with age-appropriate, relevant teaching. Your child will hear the truth of God’s word and learn how to apply it to their lives. They are led by adults who are DBS checked. For more information about the Kids work @ Hope, check out this page here. Reserved guest and disabled parking is available @ Hope. 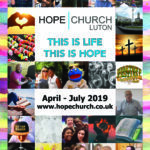 The Welcome team will be around to give you information and welcome you to Hope Church. Feel free to sit where you like (we suggest not on someone’s lap unless you are under 2 years!). The children will leave the service around 11am for their own fun time. We encourage you to worship and move about with your children. Flags are located on the front right hand side of church. Youth will leave after the notices. Tea and coffee is served at the end of the service (12 mid day). Please stay and join us. We value the contributions during the service. If you have something you would like to share please check it out with the service anchor who will be on the front row. The service host(s) will introduce them at the start of the service. We would love to keep in touch with you and let you know what is going on at Hope. Your welcome pack will include a card to enable this to happen. The welcome team will be on hand with pens and happy to answer any questions you may have. Want to attend a welcome evening to find out more or ask questions face to face? Are you a student coming to University of Bedfordshire in Luton?